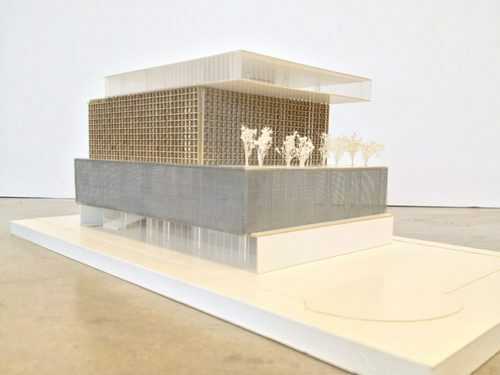 This little model is a mixed-use office, retail, and restaurant building developer Asi Cymbal is working on with the starchitect-about-town, a man who’s been designing oodles of buildings in Miami lately, Enrique Norten. Curbed went over to the Cymbal offices to take these pictures earlier today. The building appears to be divided into zones, with (we’re guessing) retail at ground floor, followed by two parking levels enveloped in some kind of metal mesh, then three levels of office space flanking a shaded terrace, and a restaurant perched atop in a glass box. SFBJ reported last month that Cymbal is doing the 27,000 square foot project, which is located at 112-130 NE 41 St. in the Design District, slightly west of Craig Robin’s insta-Soho-like-mall, and may or may not be called Museum Village. An older version on his website uses that name, perhaps referring to the nearby De La Cruz Collection, but that seems like just a bit of a stretch. New renderings, says Cymbal, should be out in a matter of weeks.